We don’t want to rub it in… but here’s what you missed! We missed you at our 12th Americas Structured Note Showcase and Awards last week! CLICK HERE to see the photos and don’t miss out in April 2019! Email me now to get on our priority list for an early bird discount for next year – and tell us what would make you want to come if there was anything missing for you from this year’s programme. The Structured Americas “Big Year and Brighter Future” Lunch, Showcase and Awards! It’s been a game changing year for structured notes and market-linked securities and there’s an even bigger and brighter future in view as market fundamentals improve and the traction of digital platforms gather pace. 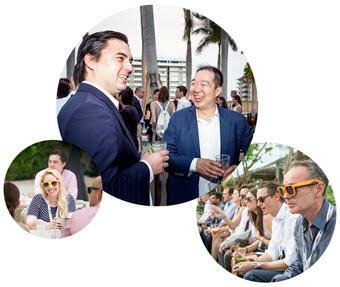 That’s the story told by our 12th Americas Showcase and Awards and the star line-up of speakers that we’ve assembled for our poolside lunch, showcase and awards at the Four Seasons Palm Grove on April 12th. So don’t miss this chance to think about how to make the most of this potential in the close and informal company of the market’s smartest minds. Buy your Lunch and Showcase pass, or full Showcase and Dinner pass now! Or email shannon@mtn-i.com. Lunch and Coffee with Mark Grant – one of the capital markets most thought provoking thinkers. Trending Structures – the top 10 fastest growing themes attracting investor dollars quicker than any other! Presented by the mtn-i analytics team. Pitch Stars – a dozen 5 minute ideas and credits pitched by the market’s top structurers, issuers and distributors- many of them Americas 12 award winners. Future Fast Forward – From Simon to Halo – the founders of the most celebrated digital platforms Simon and Halo alongside Incapital one of the market’s biggest wholesalers, reveal the potential for structured notes to become a mainstream investor product. Speed Networking – exchange cards and a 5 minute speed meet with the stars of the showcase and all our market leading attendees, colour coded so you face a client. Big Year, Even Bigger Future! The biggest year of US retail sales in a decade – driven by equity and rate-linked demand, and technology that is transforming investor engagement with structured products. This is the exciting back story that our 12th Americas Structured Note Showcase and Awards will celebrate. The awards we are proud to announce today recognise the landmark deals, market leaders and digital entrepreneurs that headlined these stunning advances – and will be the stars of our poolside lunch and showcase on April 12th at the Four Seasons, Miami. Structuring and distribution platforms have gathered new momentum and impact in the last year. Our Rising Star, Dealer of the Year and Market Future award winners point to broad-based transformation of the market’s ability to connect with advisors and investors. Building on its bold branding initiative for Market-Linked Securities, Incapital stands out for the growth and breadth of its multi-channel wholesaling effort – up 20% in 2017 and now accounting for 40% of the bank market. Meanwhile, Halo Investing and Goldman Sachs’ SIMON represent two versions of the increasingly powerful platform approach to the market. New issuer and dealer entrants are transforming the US market landscape as the universe of counterparties broadens. Our Rising Star awards highlight these notable new players. Similarly, the Asian Development Bank‘s presence among our Deals of the Year signals the growing appetite of US investors for supranational credits. Our Deals of the Year, Investor Solutions and Power Performer awards reflect major developments across the region! Appetite for structured exposure to international indices, the increasing traction of thematic stock structures, the yield enhancement offered by worst-of structures and the revivals in CMS plays and commodity-linkers are all reflected – most in Canada as well as the US. Moreover, both in Latin America and the US they also point to growing activity in fund-linked structures. CLICK TO SEE ALL THE AWARD WINNERS! Book your seat now for our poolside Showcase and Awards on April 12th. As well as celebrating the market’s strongest leap forward in a decade it promises an inspirational insight into the bigger potential of the market’s future to come! The event kicks off with the always controversial and stimulating market views of our star columnist (and Bloomberg ‘Prophet’) Mark Grant. So don’t miss the inspiration and company of Americas’ most creative and influential structured note players – reserve your seat / table now! Email your submission and book a pitch at awards@mtn-i.com. Take advantage of our 10% early-bird discount until 23rd February 2018. Email events@mtn-i.com or call +44 20 7437 1331 to book your showcase pass and awards dinner seat! If you have any questions or require any clarification about the awards process please email awards@mtn-i.com. You have until 23rd February 2018 to submit your nominations and complete a pitch meeting / call with the team. 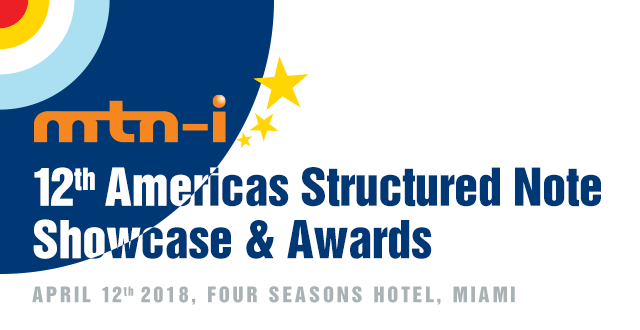 After another notable year for structured note markets across the Americas, it’s time to start thinking about dealers, issuers and initiatives meriting recognition at our 12th Americas Structured Note Showcase and Awards in April. With a flurry of new products hitting the market and some old favourites returning, we want to hear who and what you think stood out as highlights of the past 12 months in the US, Canada and Latin America. Think about clients & colleagues to celebrate with on the night and book your table / delegate passes! If you have any questions or require any clarification about the awards process please call us on +44 20 7437 1331 or email awards@mtn-i.com.